Over 10 years of PC Check & Tuning. Your computer is in good hands: Over 10 years of PC Check & Tuning – more than 11 million optimized PCs. Access a range of features to free up space & save energy. Optimize Windows – for maximum performance on your PC. Secure your data – on your computer and on the Internet. 1. Focus on what's important. PC Check & Tuning enables you to scan your hard drive for unnecessary duplicated files, such as photos or music and video files. This gives you a clear overview of your computer system and lets you get rid of any garbage data, quickly and easily. Create more space on your hard drive: Many programs leave temporary files during use. PC Check & Tuning recognizes and reports these files so they can be deleted. PC Check & Tuning optimizes your energy options in Windows, so that you immediately use less energy without noticing losses to computing performance. How many photos, videos, and audio files do you have on your computer? 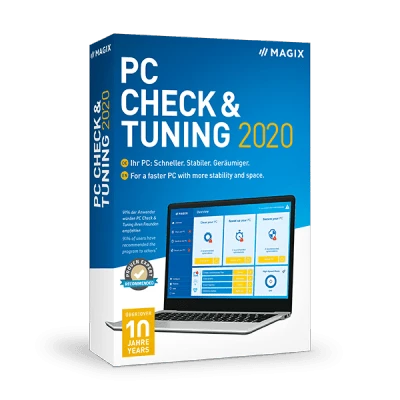 PC Check & Tuning helps you to find and eliminate the largest space wasters. 2. Performance – when it matters most. How efficient is your PC? Find out – with the performance check in PC Check & Tuning. Learn everything about the performance capabilities and weaknesses of your computer – because only those who know their computer can get the best out of it. Services are programs which launch when you start your PC. You can speed up your start up procedure easily by deactivating unnecessary services. PC Check & Tuning will help you to identify them. Take advantage of your resources: Customize your Windows operating system to meet your individual needs. An optimal system configuration offers a noticeable improvement in performance. In High Speed Mode, PC Check & Tuning prioritizes which programs need the most power. For example, speed up your multimedia software while reducing performance for less important processes. PC Check & Tuning stays alert even after optimizing your computer. With the autopilot running in the background, errors can be detected and resolved in realtime. This way there are no problems in the first place and your PC is constantly protected. Find unnecessary and even malicious software installed on your computer using PC Check & Tuning. Create more space, increase your security, and speed up your computer quickly by uninstalling them. Are the files you deleted really gone for good? PC Check & Tuning scans your PC for deleted files which can be restored and removes them permanently. Likewise, you can also recover accidentally deleted files. Optimal security and stability can only be guaranteed when the programs on your PC are up-to-date. PC Check & Tuning automatically searches for updates for every software on your computer and installs them for you. Protect your privacy by deleting temporary files, cookies, and your browser history. This way you can cover your tracks on the Internet and, for example, avoid that companies can identify you for advertising purposes.